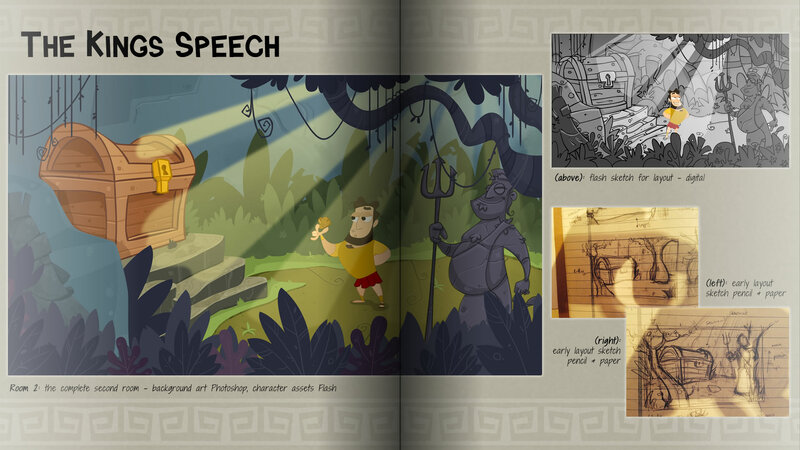 A point and click adventure set in Ancient Greece? You'd FETA believe it! It's Jason and The Argonauts meets Captain Kirk! 600 backers pledged £10,573 to help bring this project to life. We have smashed the £10,000 target and now - with less that 10 hours to go(at time of writing) I hope that we can push on just that little more to make it to my stretch goal of achieving £11,600 which would mean that I could afford to but something I've always dreamed of - a Cintiq 22HD. It will mean that my animations will be that much smoother and no doubt improve my artwork 10x as I'll be able to work directly onto the screen in a much more natural way (if drawing on a screen is indeed natural). Thank you all so much for your generosity and kind words in comments and messages, please help me to push on through this last leg of what has been an amazing campaign! For the final two hours of the campaign I will be making the next area for Jason The Greek but rather than just bolt it on I thought I would start it from scratch to show any and all of you how I make adventure games with Visionaire. Please feel free to head over any time in the last two hours and make sure you comment and ask questions as we go along as any and all feedback is most welcome! Hope to see all you budding game makers there! Jason The Greek: The Ladies of Lemnos is a new take on the old-school point and click adventure games inspired by titles like Monkey Island, Sam and Max Hit the Road, Discworld and the awesome Hector Badge of Carnage series. It’s a 2D extravaganza with you taking charge as Jason The Greek in a world of myths, legends, demi-Gods and puns galore. Explore a unique take on the classic Greek myth in it's own cartoon style! Inspired by my love of Greek legends and an almost greater love of sci-fi spoofery it's Jason and The Argonauts meets Captain Kirk and crew. It's hard to believe I'm married, I know. Right now I've got the PC demo completed (available here) to a level I'm pretty happy with but its taken a loooong while in lunch times and late nights. From here I'm onto the main event of new locations, characters and items as well as the full story. The adventure continues in... footwear! With regards to language options, In the first launch I will be prioritising English as the language of choice but (hopefully very soon) after if not with this launch you will have the option play with subtitles in German, French, Spanish and Greek (of course)! I will make sure this is updated throughout the development. These are the crew of the great ship Argo. Our Quest: to sail to new lands and locations, to seek out and return with the Golden Fleece. For these are the Argonauts and I… am Jason. Jason The Greek. Denied his kingdom by the mad King Pelias, Jason and his mighty crew will sail the seven seas in search of the Golden Fleece aboard the legendary vessel – The Argo. A selection of the many characters you'll get to... interact with! Orpheus - Jason's Egyptian second in command and logical to a fault. Philoctetes - Our Irish drummer on the Argo, giving it everything he's got. Peleus - Interested in the bones, the ship's doctor, dammit! Princess Hippsalottia - Sweet and stupid or an evil genius? Only time will tell. Lady Khaaaaaaaaaaaaaaaan - One of possibly few women you'll encounter who's seemingly immune to Jason's charms. Red Skirts - Every Trekkie knows: red shirt + away mission = you're on the menu for the alien space cabbage. Ourred skirts will be an homage to this legacy as well as a useful tip tool as they attempt to help their Captain out with their dying breath. I know what many of you will be thinking: "£10,000 is a lot of money". You're right, it is - course, if you don't think that then you're JUST the person I want on my page, please feel free to pledge away! Well £10,000 is what I think is the bare minimum to make the game to the level of quality I think we all deserve. Compared to a lot of 'professional' titles, this is a bargain. A percentage of the money will go onto reward fulfilment which will eat from the Pie budget but this has been taken into account. Should we breach the £10k ceiling then I can get to adding in extras including fully animated cut scenes, additional character quests, translations and similar ideas but we've got to make the first goal before we start getting TOO excited! Pledging now available through PayPal - Thank you for your support! Kris Fosh - in charge of Design, Development and awful puns, I'm the man behind Jason The Greek and would very much like it to be my full time job to doodle, animate and take Jason from his humble beginnings right through to discovering the Golden Fleece. I am a user experience designer and project manager for hire and a Father and Husband with a piece of my soul sold to gaming. I've worked on titles such as MMORPG RuneScape, casual titles like Arcanists and Zombie Dawn for Jagex Ltd as well as my own titles such as Shlumpf, FaceAche and Aaarghmageddon. An experienced audio lead, audio designer and sometimes composer, with plenty of titles (including AAA) on all current platforms under his belt. Titles worked on include Blood Forge, Harry Potter and the Deathly Hallows, Silent Hill: Shattered Memories and Ziggy's Lazy Town Challenge. Heres what you could be adding into your inventory in exchange for your hard earned cash! For all you chart lovers that my pie chart can't satisfy, click on the link below for a breakdown of the rewards up for grabs. As the campaign draws on I'll be adding some detail about each tier through a more picturey* approach although if you have any questions please get in touch! *Picturey is now a word. Fact. To check out the mighty chart of reward breakdown awesomeness please click here! An early look at the art book - click to see a larger version! MAYBE YOU CAN'T PLEDGE BUT YOU STILL WANT TO HELP? Thats great - any help getting to the goal would be really appreciated! Please click here to go to a sharing page where you can spread the word about Jason The Greek in three easy clicks! Or, if you like, you can (and please do!) share it yourself on your Facebook, Twitter or anywhere you think there might be someone listening and interested in Jason and his adventures! Thank you for checking out my campaign! All the tips you'll need - now get to playing! A quest like this is bound to come with its fair share of dangers, challenges and risks but - as a captain and crew - we shall face these dangers together! Taking on a large title like this is hard work but - to be honest - I love it. I will do my best to see this through and, acts of the Gods aside I will do my best to have this game out by the beginning of Summer 2014. Its a lot of work - I'm not shy to that - I know that its a lot to take on but I've never been so motivated as I hope this page shows. I have the tools, the idea and the plan - all I need now is the time that these funds can buy. Thanks for reading through the page - if you have any concerns please do drop me a message and I'll be happy to chat! I WILL STAND IN Trafalgar Square, dressed in a Toga and thank you by name – via the medium of YouTube! DRM-Free DOWNLOAD of the game post-launch including Kickstarter exclusive thank you in intro! DRM-Free DOWNLOAD of the game upon launch including Kickstarter exclusive mini-quest content! Name a character in-game + Your own level added as a mini-quest into the Kickstarter copies of the game + All the art from a room of your choice + Signed LIMITED EDITION DVD copy + DRM-Free Beta access to the game + Art of JTG PDF book + Personalised intro monologue + In-game statue bust of yourself AS A GOD! + Signed LIMITED EDITION DVD or Big Box packaging + Digital download of the game + Access to Captain's personal blog + 3 x high-res wallpapers + High-res PDF's of our Captain AND your statue + Digital copy of soundtrack + In-game 'PRODUCER' credit + PDF cut-out Captain. Invitation to launch party for you and a plus 1 + Your logo in opening credits + Name a character in-game + Your own 2 level mini-quest added to the Jason The Greek website for all to enjoy + All the art from a room of your choice + Signed LIMITED EDITION BIG BOX packaging + DRM-FreeBeta access to the game + Art of JTG PDF book + Personalised intro monologue + In-game statue bust of yourself AS A GOD! + Digital download of the game + Access to Captain's personal blog + 3 x high-res wallpapers + High-res PDF's of our Captain AND your statue + Digital copy of soundtrack + In-game 'DIRECTOR' credit + PDF cut-out Captain.